LINK: A Restaurant in New Orleans. A lunch counter, actually. It’s called Saartje, named after the given name of a South African woman who became better known as the Hottentot Venus, and it serves Nigerian fare, dishes like Woloff rice and fried plantains. 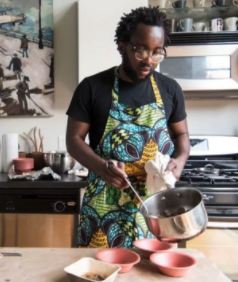 But the chef, Tunde Wey, has bigger things in mind than just food. The linked story, in the Washington Post, explains why Wey charges people of color $12 for lunch (and they can choose to take a percentage of the stand’s profits when the project is over, or not), and gives white people the option of paying $12 or $30, the larger figure representing the local income disparity between the races. Wey is taking no profits from the stand, and has a Tulane student conducting post-lunch interviews, collecting data about why diners chose the option they did. He’s a cook, but this is also a sociological experiment. Putting a face on the ways racial inequality persists seems pretty important, especially in a way that touches people emotionally. The story does a good job of amplifying those feelings, and where they come from. The Medium is the Massage: Super 8 2017. I Forgot My Yahoo Password! You can’t imagine what happened next.